In today’s corporate environment, we are expected to be innovative in addition to managing a stressful daily routine of juggling priorities between work (project deadlines, attending meetings, writing reports) and family. Of course, this means we’re often working to meet tight deadlines. This doesn’t trouble some people, who frequently say “I work better meeting a deadline at the last minute” or “I get more done under stress”, but is it really true that some people can perform at their best under stress – particularly when it comes to innovation? 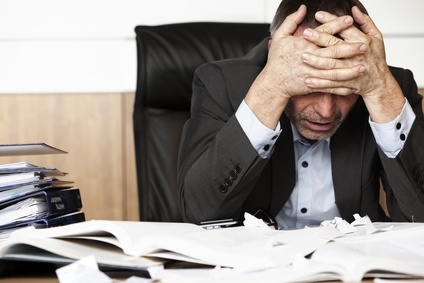 Let’s take a step back for a moment and obtain a better understanding of what stress is. Referred to as the “father of stress”, Hans Selye was an endocrinologist who performed extensive studies of the response to stress by biological organisms. He proposed there were two types of stress: eustress (good stress) and distress (bad stress). Eustress is a positive form of stress that provides challenges, motivation, and leads you to an act of fulfilment. An example outcome of this would be returning to college to further your education which provides you with more opportunities in life. 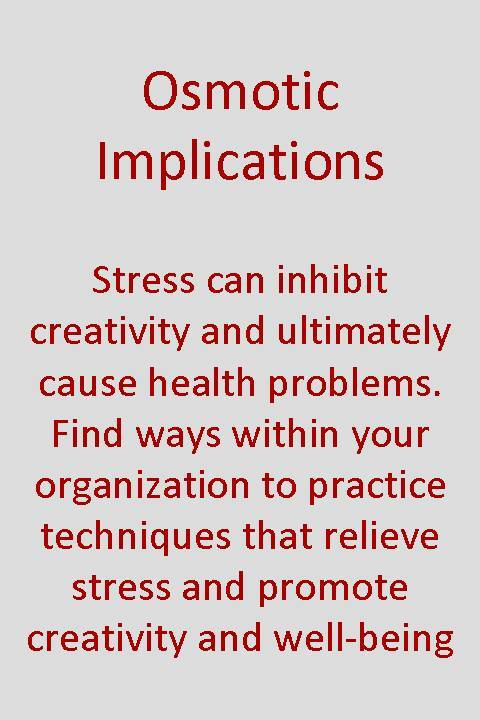 However, most of us are more familiar with the negative type of stress. How does this negative stress affect our body and our ability to innovate? Lack of control/predictability examines our desire to have flexibility in our work hours and autonomy (extent to which we can control how and when we perform our job related tasks). Many employees who do not have flexible work hours and have little or no input into decision making are reported to be less motivated and less likely to take on additional responsibilities. Interpersonal Conflict refers to interactions with any co-worker that is negative or unfriendly. This is perhaps the most common source of distress and can result from something simple like scarce resources to more complex situations where there is personal conflict among team members. Role Stressors refer to the stress that comes from the multiple tasks that are required from employees due to their position. Encompassed within this definition is the stress one feels when there is no clear definition to their job tasks, and when demands from work become overwhelming. Work/Family conflict is defined when the demands of career and family overlap. Being late or unavailable to show for an important family event due to an excessive workload will certainly be a cause of stress. Now that stress has been defined, it is important to understand the effect it has on us physiologically. How a body manages long term and short term negative distress has been termed General Adaptation Syndrome (GAS). GAS is comprised of three stages: Alarm reaction, Stage of Resistance, and finally Stage of Exhaustion. Placement of an individual into any of these stages depends upon the time duration of the stress experienced, and provides more understanding how the body will handle the stress at the stage a person is in. Without going into too much detail on each stage, essentially it is important to note that continued stress can lead to a weakened immune system, mental fatigue, and even heart disease. In application to innovation, there are behavioural consequences that will also affect the individual. There are numerous studies linking stress with impairing memory, lowering creativity, and causing poor decision making. Listen to instrumental music – not only will it lower stress, but if you play classical, it may even have the added bonus of increasing creativity. Utilize the calming or fun aspect of certain locations to remove yourself from the everyday routine. Go to an arcade, outdoors, or somewhere that is different from your everyday surroundings. On a piece of paper, write down all your worries or stressors while at the same time imagining what you are writing is escaping and erasing itself from your mind. Once finished, destroy the paper (light on fire, tear up into pieces, etc) and take a deep breath. Meditate. Even if it’s just clearing your mind or focusing on some external object, you are giving yourself a chance to momentarily escape the stress. In most corporations these suggestions may seem by management to be nothing more than diversions. One must therefore consider the possible need for proper education to encourage everyone to understand the health risks of unmanaged stress and the benefits of finding and practicing ways to alleviate it. Hopefully, with performing some of these suggestions on a daily basis, you (and your organization) can be a less stressful and more creative and innovative environment. Levy, Paul E. Industrial Organizational Psychology. 3rd Ed. New York: Worth Publishers, 2009. Landy, F. J. & Conte, M. Work in the 21st Century: An Introduction to Industrial and Organizational Psychology. 2nd Ed. Malden, Ma. : Blackwell Publishing, 2007. This entry was posted in Creativity, Culture, Thinking and tagged Creativity, Culture, Innovative Culture, Stress.